The Royal and Ancient Golf Club of St Andrews is urging its 2,500 members to vote in favour of abolishing its men-only policy, the BBC has learned. The club, which was formed more than two centuries ago, has only ever allowed men to join. A vote on proposals to change that rule is scheduled for September. In advance of that meeting, the Royal and Ancient has written to its members urging them to support a change in policy which would allow women members. The Royal and Ancient Golf Club has been the guardian of the rules of the game since 1754, although in 2004 it devolved responsibility for the administration of the game and the Open to the newly-formed R&A. 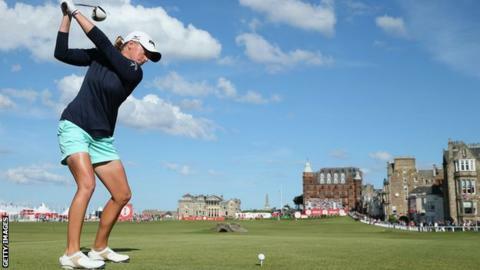 "It's a big day for the club," R&A chief executive Peter Dawson told BBC Sport. "We've done this really because of our governance role in the game. "We think it's very good for the governance of golf that we make this move. Sport has been changing, society has been changing and golf is part of that. "We think it's time this change is made." If the vote goes against women members, Dawson said that would be an "undesirable" result. He added: "The early indication is that there is great support. We will have to see what happens." Scotland's First Minister Alex Salmond boycotted last year's Open at all-male club Muirfield, while Open venues Royal St George's and Troon also bar women members. However, in 2012 the Augusta National Club, which hosts the Masters in the United States every year, allowed women to join for the first time in its 80-year history.